Western Pacific 1915 Outside Braced Box Car - RMI Railworks Miniature train and railroad equipment for your club, backyard, or park or shopping mall. 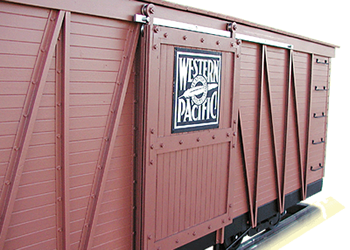 This model is typical of the boxcars built by Pullman around 1915. These cars were extremely durable. W.P. not only used them as boxcars, but also rebuilt many of them into stock cars and even bay window and cupola style cabooses. Many lasted until the end of W.P. 's rail operations. This model features not only our custom milled wood, but all the proper outside bracing.